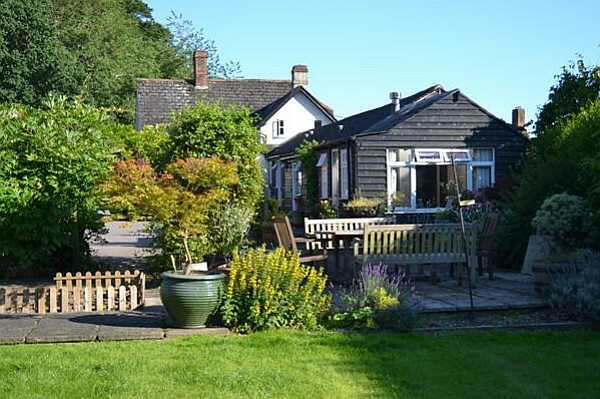 Wisteria Cottage is in the village of Alderbury 4 miles south east of the historic market City of Salisbury. It is in a quiet quaint gravel road and so offers you a very peaceful relaxing stay. 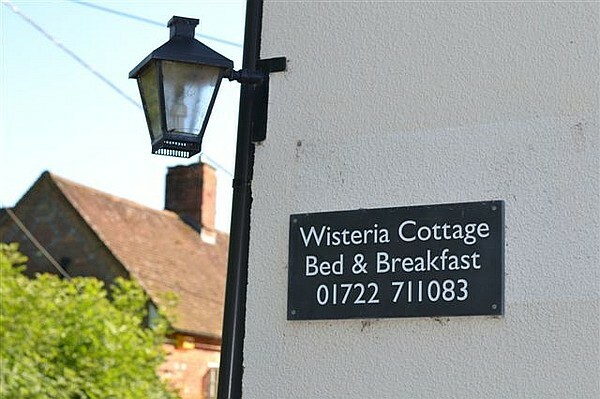 Every guest room at Wisteria Cottage has its own front door as the rooms are arranged around a large driveway, which leads into a pretty cottage garden and provides access to the communal facilities. 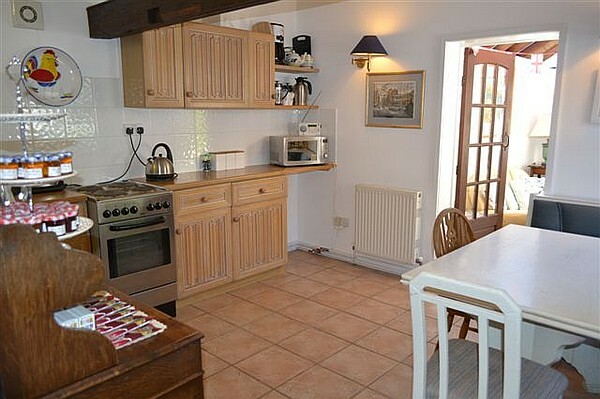 Guests staying at Wisteria Cottage have access to a fully equipped kitchen, with a washing machine and ironing facilities. There is also a guest lounge which looks out over the garden and is warmed by a wood burning stove in the winter. The perfect cosy retreat! There is plenty of storage at Wisteria for any bikes, walking or fishing equipment. Dogs are also welcome for a small additional cost. You will have access to the guest kitchen and lounge 24 hours a day, so you can relax and help yourself to complimentary tea or coffee. The superior double rooms offer tea and coffee making facilities in the rooms, as well as a flat screen TV/DVD player, hairdryer and a safe. 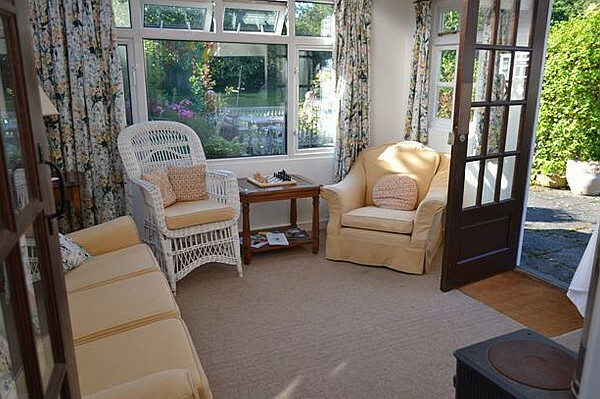 Children of all ages are welcome at Wisteria Cottage B&B (accompanied by an adult). There are baby food warming facilities and a highchair can be provided on request. 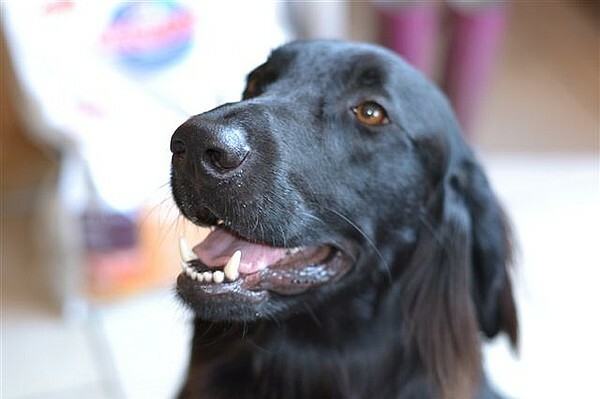 Due to other guests using the communal areas we regret that although dogs are welcome in the bedrooms and garden we would be grateful if they did not have access to the guest kitchen and lounge. The superior double rooms are furnished to a high standard and provide a spacious and light feel. 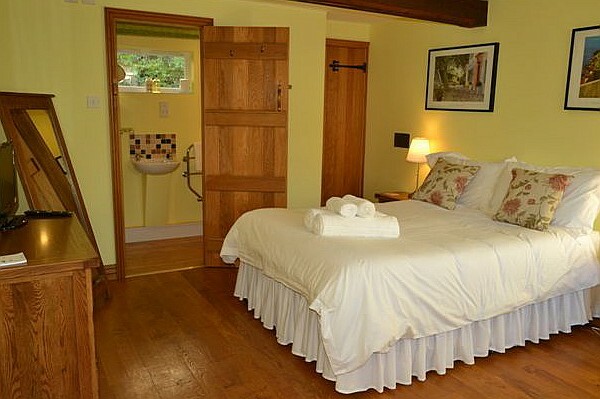 There is an oak floor in the bedroom, and tiled ensuite shower rooms. The room has a flat screen TV/DVD player, coffee machine, hairdryer, safe, fluffy white towels and beautiful egyptian cotton sheets. A small single bed can be added to this room to make it suitable for young families. £60 (plus £5 per dog) for double occupancy. £80 (plus £5 per dog) for triple occupancy. The double bedroom is spacious, light and furnished to a high standard. There is an oak floor and a tiled ensuite shower rooms. The room has a flat screen TV/DVD player, coffee machine, a hairdryer, a safe, beautiful egyptian cotton sheets and fluffy white towels. A small single bed can be used in this room to make it suitable for young families. 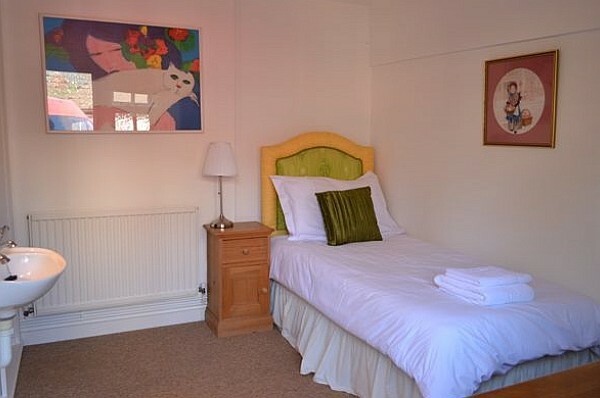 The standard single room is carpeted and has an ensuite shower room, with a W/C, a sink in the main bedroom, central heating and a built in wardrobe. Although a hospitality tray or TV is not provided in the room they are available in the communal guest areas which you have access to 24 hours a day. 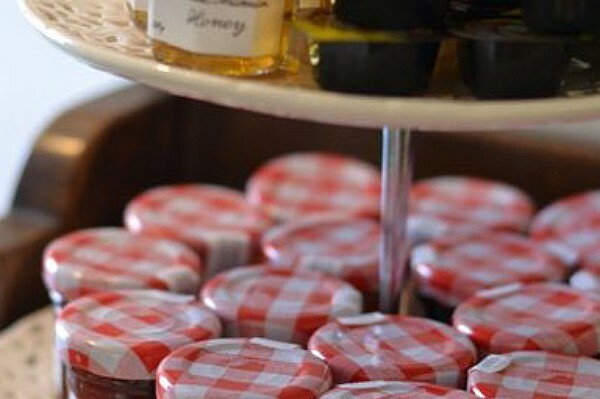 A contintental breakfast including cereal, toast, fruit, yoghurts, tea and coffee is included within the price. However if you wish to leave early (before 8:30) you can order a breakfast bag to take with you for a small charge. Breakfast bags include a fruit juice drink, yoghurt, breakfast biscuits, muffins and a piece of fruit. Or if you would like a traditional cooked breakfast this can be ordered for a small additional charge. The bed and breakfast is in a quiet village which has two pubs, both serving food, a post office, park, local shop, police station, church and a Roman Catholic chapel. 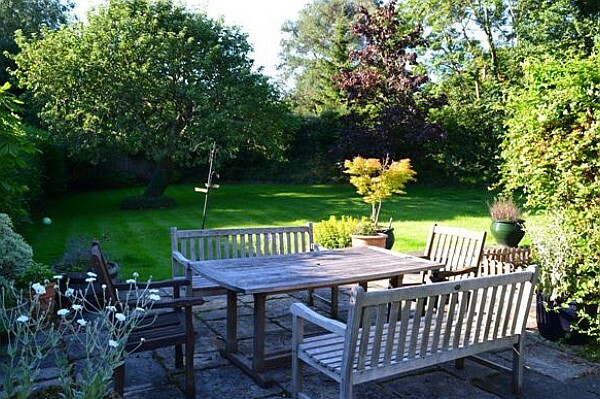 Wisteria Cottage B&B is situated on an old gravel track, with access to beautifull rolling countryside and views of Longford Castle, it really is a very peaceful place to stay. Over 750 years old, and home to the tallest spire in Britain, Salisbury Cathedral is a must when visiting the city. And iron age hill fort, and the site of the original cathedral, a wonder around Old Sarum will take you back through 5000 years of history. Alderbury is situated just outside The New Forest National Park. The forest offers numerous walks, typical english villages and many cosy pubs. Stonehenge is a very popular tourist attraction especially during the summer and winter solstice. It is mystery and sure to impress. 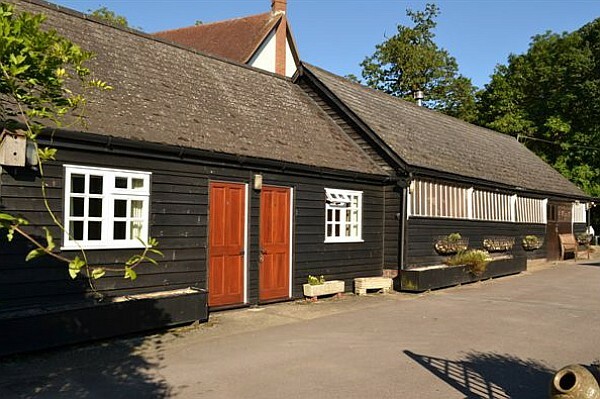 Is a popular location for weddings, corporate events, filming and photography. There is a stately home, stunning grounds as well as a Safari park! Plenty to see and do for the whole family. The excitement of the races, just a short drive away. There are two pubs within the Village of Alderbury. The Green Dragon is the closest just at the top of Silver Street, The Three Crowns is at the other end of the village. There are also numerous other country and City pubs which we'd be happy to recommend to you. A 24 hour Tesco's superstore is just 2 miles down the road. The village has a small post office. Follow A36 until for about 1 mile, until the start of dual carriageway. Take the first right turn from Dual Carriageway. Follow this road into Alderbury, and when you get to the Green Dragon crossroads, (pub on left) turn right down Silver Street. Wisteria Cottage is the second house on right.